Linley Frame has new role in swimming. Arguably, it was the only thing the late Terry Gathercole, Olympic silver medallist, Australian swim coach of the year and president of Australian Swimming, got half-wrong when he coached former 100m breaststroke world champion Linley Frame. “At the end of the day, swimming won’t pay your bills,” he once had told her. “Athlete Wellbeing and Engagement Manager”. If that title leaves you just a little confused, her job is to ensure that today’s generation of swimmers do take off the blinkers, look around them and realise that there is so much more to life than swimming. The lesson that her coach had taught her has now become, as of the past dozen days, her life’s work. Frame herself is still working out how that job title will convert to reality but, after working on the national roll-out of Beyond the Black Line, a joint wellbeing project involving the national body, the state associations and the Australian Swimmers Association, she has a sense of how elite swimmers can achieve life balance. It helps, too, that she actually feels current as a swimmer. 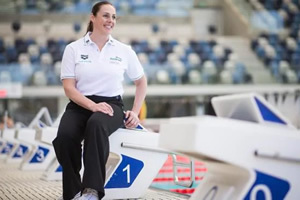 She might have quit the sport in 1995 as a 24-year-old, driven into retirement first by glandular fever and then by chronic fatigue syndrome, but she returned to it as a 38-year-old, not just to swim at Masters level by to contest the Open nationals against swimmers young enough to be her daughter.